You Are Feeling Very Sleepy…. During a brainstorming session about possible story ideas for the first issue of the Calistoga Tribune in 2010, I was trying to come up with creative angles on the whole New Year’s topic. In the past, we have written stories about health clubs, asked local bigwigs for predictions, and stopped people on the street to ask what their resolutions were. After eight years, though, the annual events and holidays become harder and harder to tackle with a fresh mind. Then I saw that we have two new regular advertisers in the newspaper: a hypnotist and an astrologer. Perfect! Here was a unique take on working on resolutions, and also something I knew nothing about. I hoped it would be interesting to me and to our readers. And so, I interviewed Anthony Royce Barnacott of Kamalot Astrology and Donna Rodolph of Hypnosis for Change. Both were knowledgeable, enthusiastic and contagiously thrilled to talk to me. But there was a bonus that I wasn’t expecting: both also offered me a free trial to get a taste of what they do. Anthony is currently preparing my TimeLine, an astrological chart which will tell what is in store for me in 2010 based on my Dec. 26, 1962, 5:43 p.m. birthdate. It should arrive in the mail in the next day or two. So that is still to come. Today, at 12:30 p.m., I was hypnotized by Donna. She specializes in helping people overcome problems, things like losing weight, stopping smoking, overcoming fears, reducing stress or managing pain. Although there were any number of things on that list I could have chosen, I selected the biggest obstacle in my life: food. I have struggled with eating disorders and weight gain and loss since I was a young teenager. I have periods of stability, then again go back into the cycle of destructive behaviors. Could hypnosis really work? Well, we’ll see. The session was surprisingly relaxing, and did not, as I thought it might, put me into an unconscious state. Instead, it was more like a deep attentiveness, with a complete absence of tension. Donna had me visualize what it would be like to be healthy and fit, and I had a strong image of myself as a runner, something I used to do, and have been considering taking up again. I still feel a bit skeptical of the whole process. But despite that, hopeful. Maybe this really can help me rewire my brain, and establish new behaviors. An interesting note to all of this was Donna’s comment that she could not offer me any “satisfied customers” names for interviews, because when she was starting her still relatively new practice, most of her clients were Christians. As in fundamentalists. And, because of that, they were very guarded about their participation. Apparently there was some sense that a good Christian shouldn’t be turning to something as potentially “spooky” as hypnosis for answers. I guess God was supposed to do it for them. All of which made me reflect on my own spiritual practice. I didn’t turn to hypnosis and astrology looking for answers – what I was really looking for was a story. But once I was there, it made me wonder a bit. How does all of this fit in with Zen? I guess the good news is that it doesn’t have to fit. There’s enough room in my Zen, anyway, for everything….even the far out stuff. Because it’s not a religion – it’s a way of being present for life, no matter where each day takes me. In ancient Japan, lady courtiers spent most of their lives indoors. During the Heian era, 794 to 1185, the beauty ideal was very fair skin, so staying out of the sun was common practice. The women spent their days composing love poems and letters to gentlemen, having them delivered, then eagerly awaiting the response. They also engaged in incense contests, and music and theater performances, as well as spending a great deal of time coordinating the colors and patterns of their many-layered robes. In the main living space, women slept on the floor (as they still do in Japan). It was a large, open room, with few places to keep personal belongings. Each woman, however, had her own pillow – a shallow wood or ceramic block-shaped item, that contained in it a slender drawer. The doors became the repository for small personal things, like hair combs or love letters. It was here also that the women kept their journals, small notebooks filled with their musings about life, poetry, notes on love. The journals came to be known as “pillow books” because of their most usual “secret” spot. The most famous pillow book is the one by Sei Shonagon, written in the 990s, which has survived to this day. It is a fascinating look into life in Heian Japan, as well as being a masterpiece which can stand on its literary merits, separate from history. I have always been intrigued with the idea of the pillow book, placing a personal record of thoughts underneath your head at night, pulling it out to record the day’s entry. During the Rohatsu Sesshin, those five days that we spent sitting in the zendo, it was similar to the great living room of these Japanese courtiers. Although we slept in a separate room, all of the rest of our day was spent side by side in the zendo, with our personal space limited to the zabuton and zafu that we were sitting on. Much to my amusement, I realized at some point during the retreat that my zabuton had become a Heian “pillow” of sorts, with personal items stored not in a drawer, but simply tucked underneath. During the course of the sesshin, I stowed Nicorette lozenges, my clappers for the tea ceremony, my kokyo’s chant book and daily schedule, gloves, a hat, tissue, a small notebook, a pen, and even extra “feminine products,” not to mention the growing stack of support cushions on top of my zabuton. It made me wonder what I would have found if I had gone around the room and flipped up all the cushions…. and I’m taking the night off! More Zen-isms on the way tomorrow…. I received a holiday greeting from Tony Patchell that was simply too good not to share – so I am stealing it, and offering it up to all of you…. And with that….off to eat more cookies! Two days before Christmas, and we were immersed in the Wednesday deadline at the newspaper, having eaten our fill of chocolates and cookies, when the phone rang. I happpened to miss it – I had stepped outside for a quick smoke. But when I sat down at my desk, I heard my boss Pat say, “Well, I guess I better go home and help Ramona deal with this.” And she headed out the door. What? Someone stole their Honda mini-van? Yep. It was gone. They had parked the van in their own driveway, which is on a quiet cul-de-sac in Calistoga. As is their frequent habit, after years of small-town living, they had left the keys sitting in the console, because Ramona needed to move it in the not-to-far-off future. And someone had just come along, opened the door, inserted the keys, and driven off. Merry Christmas. Although stunned to hear the news, part of me is surprised that this doesn’t happen more often here. Having lived in large cities for much of my adult life, I am always amused by the low security standards of small town citizens. Almost no one in Calistoga locks their cars; many leave their keys in the console or under the floor mats. And at least weekly, I see an idling, empty car parked in front of the post office, its driver checking his P.O. box inside the building without wanting to bother with shutting the engine off. I still lock my doors. And I clean out the car every time I arrive at my destination. If I must leave something in the car, valuable or not, I put it in the trunk, out of sight. In my old neighborhood in San Francisco, on 16th and Capp Street in the Mission, even leaving a single cigarette on the dashboard was an invitation for a break-in. Just like learning to walk the streets at night, making yourself an unattractive “customer” for thieves is part of urban survival. Last summer Calistoga had a rash of car burglaries. People kept calling up the police station and saying, “Someone stole my designer purse (or my laptop, or my cell phone).” When asking for details, the police found that almost without exception, the items had been left in plain view in an unlocked car. I wouldn’t say anybody deserves what they get, but, come on, now! Maybe work a little bit at making it harder for the bad guys? That said, I still feel pretty awful about poor Pat and Ramona. Because it’s not the stolen van that they’re broken up about. The rear of the car was loaded up with all of their camping equipment: old Girl Scout cookware, plastic plates made by their son and nieces and nephews, the air mattress they’ve been using for years…in short, memories. That’s what was stolen. And what about the thief? Of course, the things in the van will mean nothing to him. The van itself might be simply a convenient solution to a temporary transportation problem, soon to be abandoned somewhere by the side of the road. Theft is such a heartless act. Taking what is not yours – yes, it’s wrong. But beyond that, look at the consequences for the victims: shattered trust, loss, anger, inconvenience, financial hardship, interrupted lives. For what? Easy money? A thrill? I would make a rotten criminal. The karmic burden would be so heavy I wouldn’t be able to get out of bed in the morning. Keep your eyes out for a white Honda mini-van with a license plate frame that reads: “I’d rather be in Calistoga.” She’d love to be home for Christmas. Tonight at the Healdsburg sangha, we held a Bodhisattva ceremony, commemorating those in our lives, living or dead, who have helped light the way, and alleviated our suffering and that of others. People brought photographs and placed them on the altar. I chose to honor Sabrina, my wife, who inspires me continuously with her generosity, compassion, and open heartedness. Darlene Cohen echoed my sentiments by honoring her husband, Tony Patchell, especially for his words years ago that gave her the courage to continue practice when her own spirit was flagging. 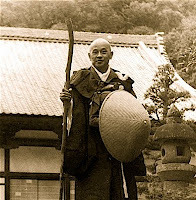 Tony brought a beautiful black and white photograph (shown here) of Suzuki-roshi, the Japanese priest who came to the United States and founded the San Francisco Zen Center, and later Tassajara, the first monastic Zen community in the country. Darlene and Tony (and so all of us, their students) are in the lineage of Suzuki-roshi, and Tony brought his image so we would all remember that without this man, we would not be together on this night. Leave it to the great teacher. Somehow, this charming Japanese priest found just the right words, time and again, to calm our worries, to give encouragement, to challenge our smugness, to push us to new discoveries. I never saw him with my own eyes, but feel privileged to be meeting many people who did know him, and can share stories. Somehow, my life in the past month has spun out of control. Normally I am very neat and orderly. That’s simply what makes me feel secure. When that neatness starts unraveling, it’s a sure sign that I’m in overload, for one reason or another. Right now, there are piles everywhere. The two baskets in my kitchen that I use to hold mail and other miscellaneous “to take care of” items are both overflowing. There are stacks of clothing on top of my dresser. My office is filled with precarious tilting mountains of paperwork, magazines, and notebooks, gradually encroaching upon the workable space. I have packages from UPS that haven’t even been opened yet. My bookshelves, normally holding only the books that belong there, have miscellaneous items perched jauntily on all the edges. The closet which holds all of those things that don’t need to be out in the open is bursting at the seams. When I open the door to retrieve something, like Christmas wrapping paper, I am hard pressed to get the door closed again, because of the cascading chaos. This state of affairs makes me uneasy and discombobulated. I take one look at the disorganized mess around me, and want to gnash my teeth and tear my hair. For many years, I moved constantly. I rarely lived anywhere longer than a year, and sometimes I moved two or three times in a single twelve month period. Because of that, my belongings were very minimal. I kept only what I actually needed, and traveled light. Six years ago I met my partner Sabrina, and after we moved in together, into her house, that all started to shift. It began slowly. Initially, I continued to keep all of my things in a single room. But gradually, as I settled in, and felt more expansive, I began to move into other rooms of the house. Now, with the exception of Sabrina’s office, I have “things” in every room, parts of me throughout our entire home. It is a testament to the sense of security and “at home-ness” I feel that I have been able to transform my nomadic, pared-down lifestyle into this one of expansiveness. So, it appears that allowing myself to be messy sometimes might actually be a sign of health and wellness. Perhaps it means that I feel safe enough to allow things to get crazy, knowing that they can again be brought back into alignment. And it is, after all, only a few more days until time for New Year’s resolutions. I can make an easy one right off the bat – I vow to clean up the piles. The theme of our Rohatsu Sesshin this year was continuous practice. My understanding of this is learning to take our practice into every aspect of our lives, instead of separating zazen from all other activities. A sesshin is an ideal place to do this, because the tight schedule and focus on silence and routine remove many of those distractions of our ordinary lives. It is much easier to be mindful at a meal when there is no conversation at the table, simply a keen awareness of the food on your plate, the tastes in your mouth, and the sounds of humans eating. Staying in the moment is more challenging after the sesshin has ended, when you must return to jobs, chores, and family life.For me, the “to-do lists” very rapidly create a mindset of worrying about the future, instead of staying right here. I love this quote. I love the idea of expressing gratitude by practice. Darlene also said, during that talk, that it was our task nor to become a “better” self, but to become more fully who we are. It seems to me that these two ideas are integrally connected. Learn and become my own true self; practice continually in order to show thankfulness for everything. Two steps both incrediby easy and incredibly hard to follow. Every moment of every day that I can create space around myself, a gap between input and reaction, a slowing down of movement, I am moving closer to active zazen, continuous practice. What do you do to bring practice into your daily life? Includes Full Moon Ceremony (It’s a blue moon!) and 108 rings of the densho bell. At midnight, warm sake upstairs with potluck and festivities.